Alejandra Veltmann is a graduate of Anderson's class of 1992, earning her BBA in Accounting with a GPA of 4.0 as well as acting as commencement speaker. After graduation she joined the international accounting firm of Arthur Andersen in Albuquerque, and later transferred to Houston in 1995, when she joined KPMG LLP, another Big 4 accounting firm. After 10 years in public accounting, she began her consulting career in the role as CFO for clients in various industries, including manufacturing, distribution, residential construction, financial institutions, and oil and gas services. A native of Mexico City and with a Spanish fluency of business terminology and culture, she dealt with accounting issues for multinational entities, and provided training of client executives from Mexico, Canada, Costa Rica, Colombia, Dominican Republic, Spain and China. Ale left the financial services industry to hold financial management positions, including controller for a $2 billion publicly held oil & gas services company. She currently serves as Vice President and Chief Accounting Officer of Paragon Offshore, a publicly held global offshore drilling company. 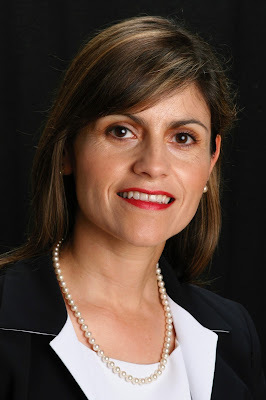 Ale is a member of the Texas Society of Certified Public Accountants and has served as board member, treasurer and finance committee chair for the Women’s Business Enterprise Alliance in Houston, and board member of a private oil & gas service company. She is also an active supporter and a volunteer translator for a women’s non-profit organization. She likes running, loves music, enjoys playing the piano when no one can hear her play, and loves to spend time playing golf with her family. Anderson School of Management's Convocation takes place on Saturday, December 17, at 2:00 p.m. at Johnson Gym. All are invited.